Newcastle fans are planning a walkout during Saturday's game against Cardiff in protest over the club's management. It is set to take place in the 69th minute and comes after the worst losing run since 1986-87 that has seen them slip from European contention to a possible finish outside the top 10. "It's the lack of ambition that has driven fans to think there must be some symbolic way to protest," said fans group spokesman Mark Jensen. "It's a club that's falling apart." According to the statement issued by protest organisers Newcastle United Supporters Trust, the 69th minute has been chosen as a reminder of the last time the Magpies won a major trophy - the 1969 Fairs Cup, now better known as the Europa League. NUST board member Jensen said owner Mike Ashley was only interested in the club as a business. "He had no previous attachment to Newcastle," said Jensen. "Any money he put in has been as an investment that he hopes to get much more out of at the end. If Newcastle were run with ambition, then we can all be winners - Ashley and the fans." Newcastle, ninth in the Premier League table with two games remaining, declined to comment when asked about the planned demonstration. The form of the St James' Park club has been in decline since the club to Paris St-Germain at the end of the January transfer window. Having begun 2014 in eighth and with 33 points from 19 games, they have picked up only nine points from a possible 39 since the Frenchman's departure and have lost the last six successive matches. 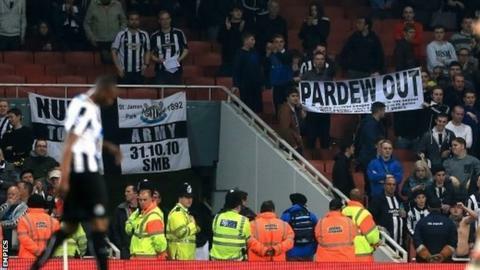 Banners protesting against manager Alan Pardew have been visible in recent fixtures, including at Emirates Stadium where Newcastle suffered their latest loss - a 3-0 defeat by Arsenal. The NUST statement issued on Friday makes no mention of Pardew, only Ashley. Jensen added: "Fans are way past caring whether Pardew stays or goes. He's seen as part of the problem and not the solution. Pardew is seen as a puppet. "The vast majority want Pardew to go, but they wouldn't believe it would change an awful lot." Pardew said on Thursday: "I won't walk away. I love this job and am going to fight as long as I can for it. That's what I have always done. "I have been in tricky situations before. This is a situation where I perhaps need to dig deep, and I have got no problem in doing that."